Read orders carefully WINGSTOP EMPLOYEES! Walnut Wingstop is the Best! The app is quick and easy to use. However there is no option for extra sauce (such as extra buffalo sauce) on the side. Even if we had to pay for this or to be able to request in a special notes section. Otherwise the app is smooth to use and quick to re-order a previous order. Also, there is no option for medium wings - although they are available in the store. Font is way too small and there is no way to change it. The app works but the number of taps it takes to place even a simple reorder is excessive. A mobile pay feature, especially that supports ApplePay, would make it even better. 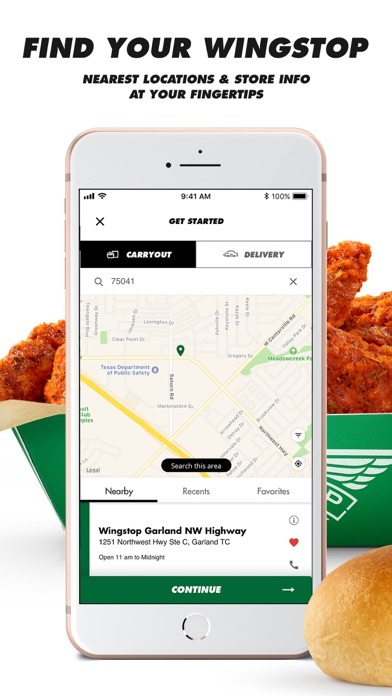 I love this app but i think it needs an extra box where you can put extra seasoning for the wings. Please add PayPal, Venmo or something to pay in the app. Save me time and saves your restaurants from having to take payments at the store. Most other similar apps allow for payments. Look at subway. It’s not hard. Only Complaint Is That They Need To Add Rewards Points To Eventually Get Free Items After A Few Points. Or Atleast Add More Deals Or Coupons. Other Than That I Love The App And The Food. Never Fails To Satisfy The Hunger!! Love the App, Love the food! The app makes everything quick and easy when on the go! This is the second time I have had COLD food delivered. You should insist on whatever delivery company YOU have chosen to have food warmers or don’t offer delivery. The driver got lost even though I put my crossroads in the order and he has no warmer. Cold chicken and cold fries are no good. Great App and great place to eat WINGS!! Food is great, Much better than BWW and the app is very user friendly. Sometimes after you make all your choices, the order will not submit. You will receive an error message stating the location isn’t accepting mobile orders. No other explanation is provided. This error should be displayed BEFORE wasting your time making an order. I tried reporting this issue via the app, but the contact us feature wouldn’t finish processing. Therefore had to provide feedback via their website. Rinky dinky app at best. What happened to the teriyaki wing sauce??? Option to write out notes in order. Like “sauce on the side”??? The app should have an option for “wet”. Put Mango Habanero back on the app and I will raise my rating. If I had ordered in the store instead of on the app, someone could have told me that wings were cheaper on Mondays and I could have saved money by ordering it all separately! I ordered wings for pick-up. Had no issues with finding the closest restaurant, choosing the food, inputting my billing information, and picking up the food. I received a detailed receipt of the order to my email (which I liked) and the food was actually ready before the estimated completion time (on the app). No complaints. The design of the app is nothing amazing but it serves its purpose. I placed my order online based on their advertising it was supposed to help eliminate the wait well not in my case! I watched order after order go out the door of people that had come inside and placed their order, even one huge order that was over $134 went out before my little single order!!! No one apologized or offered even an plausible explanation of what the hold up on my order was. I had to request a manager to get my order finally and she was in too big a hurry to even be polite, it was basically hand me my bag and turn around and walk away!! I do not recommend this location at all!!! Disaster, wouldn’t have waited by these were for my wife. App is useless for retrieving details of order easily. I’m not a review writer. Good bye Wingstop. I really like using this app because it helps to find the best price on the different combinations you like to order in. My only gripe is that it needs a special instructions spot to add anything you may get done that doesn’t show up on the app, like extra wet. I always have to call right after placing the order to make sure that gets done, otherwise there’s always dry spots on the wings. needs an U/I update for Iphone X users. This was the worst ordering experience of any app I’ve used. You guys messed up big time by removing mango habanero. Never lets me pay with card. Payments do not work properly. After spending time selecting an order. Trying to pay, errors always prevent me from completing my order. Done with this app! I love this app it saves me waiting in line! Its easy and fast!!!! If so I’d order more often. I love wingstop and usually never have any complaints but today’s order was a little different. The wings were really salty and the fries were soggy. I picked up my order a few minutes after it said it would be ready and it only took me 3 mins to get back home. Hopefully next time it taste a little better. Love this app. Love this place. Just wish they had little trash and so I could atleast throw away my straw wrapper when I pick up an order to go. I really enjoy the experience of using this app. Easy and functional. Accurate time fast and easy! They take way longer to give you your order when you order through here. Based off personal experience, three times. I would like a comment section. By far the best quality wings, and their app is fast and easy to use. Excellent customer service, never missing anything and usually very fast and hot. Easy 5 stars! 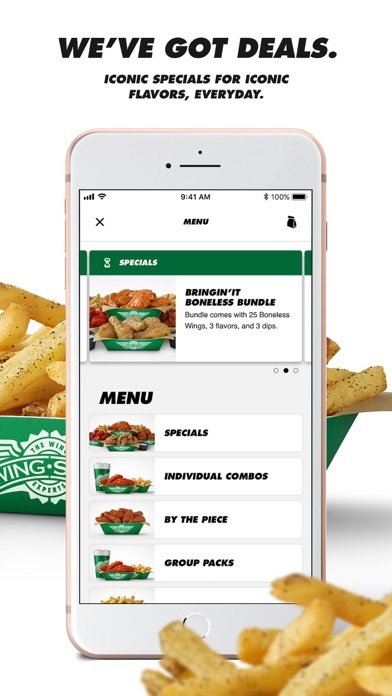 I love the convenience of the Wingstop app as well as the wings. So easy to order, great options (extra well done wings)! Thank you! Can’t wait to dig in! This is the best Wingstop I have ever been to. Normally I only ate wings about once a month but this place has me eating once a week. Thanks for being the best! Love the food, delivery is normally great, but what happened to the free form box for customizing your order? I love this app. It comes in handy very often. Can place my order and pick it up on the way home. Even shows the daily specials. Every update just takes it a tad bit higher in ease of use. Good job guys. That crinack you hear me?? I love the wings. Nothing beats lemon pepper I will fight everyone on this. This app is very well put together. It allows for the customization of my orders and is very transparent about pricing! Overall it works really well! Rollout delivery to all locations and I’ll be 100% satisfied. Best wings around. It’s so convenient let’s me get things done and then I can just go pick it up! The app is extremely easy to use, the only thing is there are options In the store that are not on the app. What happened to the all drums and/or all flats options? Awesome app! Works great to order ahead!! App was good before why change it? I like the new layout but the older one was fine, biggest issue here is you can’t customize orders like you used. For example you can’t select if you want all flat wings in the app when ordering by the piece. Please fix this. I actually have to call in after placing my order to make sure that I get all flats. Best wings and service ever!!!! The combination of a good app with a great store is key. My Wingstop store in Yuma, AZ always has my food on time and nice and fresh. I have never been given a wrong order. What more can I ask for? Had to un-instal. First you couldn’t pay in the app. Now you can’t order unless you pay. Do stupid. I love eating from this establishment and ordering whether it be over the phone, online, or the app but I wish that they had some coupon deals like some of the other competitors around... just you know for some people who like to feel like they are saving every once in a while. Or some kind of point or reward system. Looks way better then before and it works !!!! Sometimes the option to have my wings ‘Extra Well Done’ isn’t available. Like when you choose to add 5 wings to an order, it does give you the option. Would recommend to download this up. Its very easy to use! I’ve ordered delivery with the app before but now it won’t let me order anymore because for some reason it will not let me add my debit/credit card. It doesn’t even give me an option to add them. It only gives me an option for gift cards. Please fix!! You guys need the Apple Pay option!!! - requires a credit card even for carry out. No pay-in-store option. - no ApplePay support - doesn’t remember past orders without creating an account. - if a card is declined, as for a mistyped card number or zip code, there is no notification, the order just disappears. It’s so nice to order from the app and just pick up on the way home!! They forgot our rolls, our dips and our veggie sticks again.... 🤬 and of course we are already home!! Didn’t think we had to check. Lesson learned. It’s a simple app. Does what it’s supposed to do. It would be cool if they had a rewards program of some type. Are you able to pay for your order in the app now? All I want after work is Wingstop. And it never disappoints! Love the staff just as much as the food. Thanks guys! I didn’t want all flats but couldn’t choose from not a certain flavor so had to leave it alone and get what I get. Everything else was easy to use and I like to choose pay in the store so thanks for that option!! At one point in my life I felt like something was missing. I had other wings all my life, and yeah, they were DECENT. But it wasn’t until a windy night in Orlando brought me to UCF Wingstop. You know how people throw around the phrase “life-changing”? Well I’m not, this was the day my life just got better. Sad? Wingstop. Happy? Wingstop. Mad? Listen to Bellie Eilishs newest album and Wingstop. Wingstop is for all the people who love good things and good wings. Wingstop is my wife’s and my treat for the week - every Friday we order Wingstop. The app was great I could order it in just the right time to put my kids to sleep then go pick it up without having to step away. The new app is very good and easy to use, but recently they removed 2 key options that without them don’t allow me to use the app. Making the wings and fries well done and selecting if I want all drums or all flats. I use both those options every time I order but recently those options are not there. I’m going to call my order in today, but without these options that removes the convince of the app and ability to quietly order and time it out. Unfortunately this might lead us to order from somewhere else moving forward. I will def update the review / stars if this gets fixed. What happen to the flats option? I can only do it if im doing a re-order?? I love using the app just wish there was a way to pay in app like there used to be. Make it a lot easier when you can just walk in grab your order and go. Very user friendly and allows order specifications!!! App states free delivery until april 5th, placed order on 3/30 and was charged delivery fee. False advertising. This is my first review evvvvverrr, so you know this serious!!! I eat wing stop at least twice a week. I always order well done and the option is no longer in the app!!! Please add the option back!!!! Smooth process, but I’d love the ability to order wings with sauce on the side! The only option it gives me is either fully w sauce or to order plain & then pay for a side of sauce. Even just adding a comment section on your online order would be helpful. The latest version is so much better than it was. Smooth, good UI/UX - native. From an iOS Dev, this works! Amazing over haul from the ground up! The app has finally gotten a long over due redesign, I think it should’ve been like this two years ago at least. Anyway, the app now actually looks like a lot of effort went into it and it no longer looks like a cheap and generic design. Awesome work! My only suggestions are that we should be able to add a valid payment card in the settings without needing to use it for an order first, especially since it was used and recognized prior to this over haul. And the starting an order button covers up the nearest/favorite location on the home screen so that was a bit confusing at first. Maybe change that around some? Again, awesome design! Apparently this app was just updated today and was bringing a new design to it. Well.... they did.... it shrunk more like to the size of the iPhone 4. The app is not iPhone X or higher friendly. Over a year later and not up to date... terrible. App refreshed, still not optimized for the larger phones. So much screen real estate that is left with nothing on it. Please do delivery!!! 🙏🏻🙏🏻🙏🏻 😩 love the wings and fries !!!! I ordered one thing on the app and got something different (on both things I ordered). The store just said that he recommends that the order be called in. I won’t be using the app again! App is convenient and quick! Have everything listed and makes it easy for pickup! Terrible experience again! 3 strikes, you are out!!! This is the third time we have been there and the service is terrible! They are very inattentive and make you feel that they are doing you a favor by being there. Wings were extremely dry and barely any meat on them. We have been to other Wing Stops with good experiences but in other cities. Such a shame that we can’t enjoy them in our own home town. This app has many flaws. 1. No options to change how to pay 2. No options on how to add special instructions 3. If it’s not on the app forget it... your not getting it Example: no one in my family likes original hot except me... so I get it on the side but this app doesn’t allow this choice. 4. You can’t choose your drink flavor until at restaurant... but if someone else is picking up for you - how do they know without communication with you. So I find it hard to believe that this app is above a four star unless someone is rating the food - which is not what these reviews are for!!! Wingstop sometimes sends promos like free 5wings. Please add promo code section so you can order via apps. I couldn't find it so I ended up calling shop. Don’t know why the latest app update made the final size almost impossible to view and order. Always been at least a 4 Star app but you guys gotta fix this issue. needs an U/I update for Iphone X users. Also, the font is super small and it’s hard to read. When placing a pickup order over 25 dollars, app won’t give you an option to add a payment method. Unresponsive... on a IPhone XS Max/5GWiFi. I’ll leave the rest up to you. While ordering on the app I’d like to order 2seasonings/sauces on all wings, rather than it being half and half. For instance, I’d like to have the Original Hot sauce and Lemon Pepper on all wings, rather than it being 5 Original Hot and 5 Lemon Pepper (10piece combo). I’m able to do this in store, but on the app there is no option or special instruction to be able to make that choice. Just a small inconvenience, other than that the app is great. They need to add a option to add a message to the restaurant, i like my wings nice and wet. So every time i order throw the app i get them dry. The font is seriously tiny and the option to pay at the restaurant no longer works. Not a great in-app experience. (Believe it or not after about a year the app STILL ISN’T FIXED) This app used to be great - i order at least twice a month for take out orders, ranging from $30-40 worth of food. Their checkout option allows me to pay at restaurant, so I just click order, and head to the restaurant to pick up. Easy, right? Tonight I tried to place an order, and on checkout it now tells me that ‘on orders more than $30 we require a prepayment’. Okay THEN GIVE ME AN OPTION IN THIS APP TO ENTER IN A CREDIT CARD PLEASE. Right now the app only provides me an option to ‘pay at restaurant’, and then rejects the order without any other option to prepay. Ended up going to the store and showing him my phone to place the order. The cashier told me that many people complains about this same issue but unfortunately the store has no control. Fix your app please. The App works great, except for the fact that the font is incredibly small. Very hard to read. Fix the font for iPhone XS Max Please!!! Fix the font for iPhone XS Max Please as it’s way way too small...Thanks!!! I tried to order some wings and come to find out the mango habanero flavor is not on the flavor list!! That is my go to flavor to get!! Please add it!!! It’s a pretty cool app. Great customizing options. 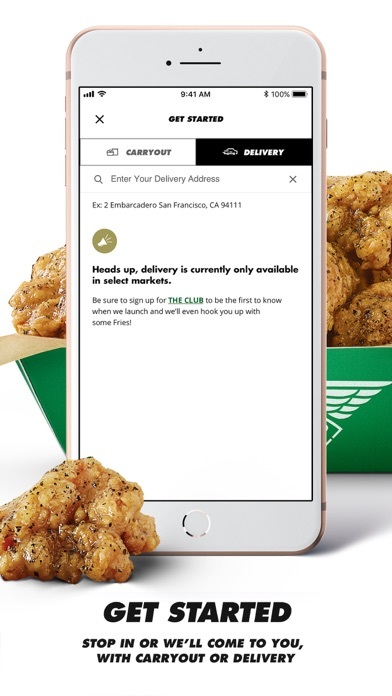 It’s the only way I order Wingstop honestly. Horrible. It’s won’t let me place an order if it’s over $24 unless I prepay on the app, but it doesn’t even give me a prepay option for personal cards. The only payment option it allows; is pay at the store or gift card. This may be man’s greatest achievement...the ability to order wings from your phone. App works well would be cool to have a QR code to use for quicker pickup. Great wings too! Keeps saying error from the start. So i download the app, place an order and then go to checkout. It gives me the option to pay at the restaurant. Then i get a mssg saying i had to prepay since it was over $20. I input my credit card info and get an error stating I can’t charge anything over $0.00 on my card? So I try that thinking I can still pay in store. It gives me a mssg saying i have to prepay since over $20. I give up and order on their website, 20 minutes later. I like to order ahead and just pop in to pick up my food. I’ve tried to use the App 3 times and it has not worked. 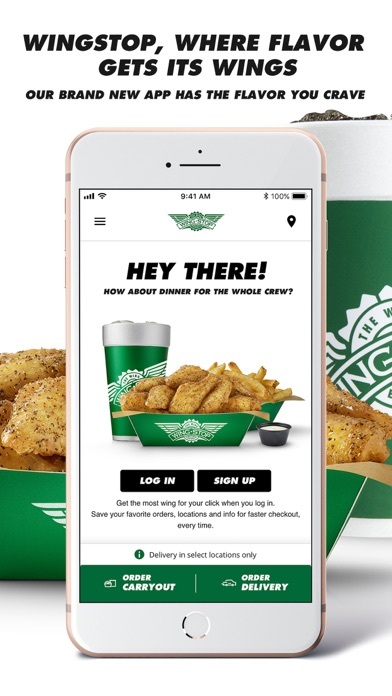 The wings are good, but the app stops us ordering more often. My daughter ordered two meals for us and a brownie (because it popped up asking if she wanted to add to her order and it looked good). Got home and (surprise, surprise) the brownie was missing. Paid for food that we never got. Argument for going IN and ordering. The font on the app is super small! The latest update LOST all my saved favorites, my local store, and the credit card number I’d saved and now REQUIRES that I log in before I can save a store or an order. What a step backwards. They don’t want my money? Tried for 15 minuets trying to figure out how to pay for my order and the app doesn’t want to take my money. I don’t know how this can be a profitable app. My order could have been done over the phone before I can figure out how to order through the app. Lets you build order but not purchase through it!! Tried buying food for my girlfriend from work but after building the whole order up it didn’t let me pay through the app like mcdonalds app does!!!! Only pay at store or gift card c’mon!!! The app itself is not bad, the new layout is much better and more attractive than before. However, there should be a section where you can write in your own special instructions for you order. For example, I like to order the lemon hot flavor on my wings but the app doesn’t have that as a flavor and there is no way of writing it in on the app either. I usually have to make a phone call to order the flavor. So a special instructions box would be greatly appreciated. I’ve been trying to order on this app for a while now but it says “Orders must be above $15” to be delivered and it still won’t go through if the order is $25. Fix this please. Not worth it, i end having to call in. Payment is impossible.... select pay in store. Payment over $15 must be payed in advance. No options to pay with a credit card??? You literally can’t order because you can’t pay. The app is always a problem. It glitches constantly. Also when are they going to create a rewards program? Almost every other app has some sort of rewards program. 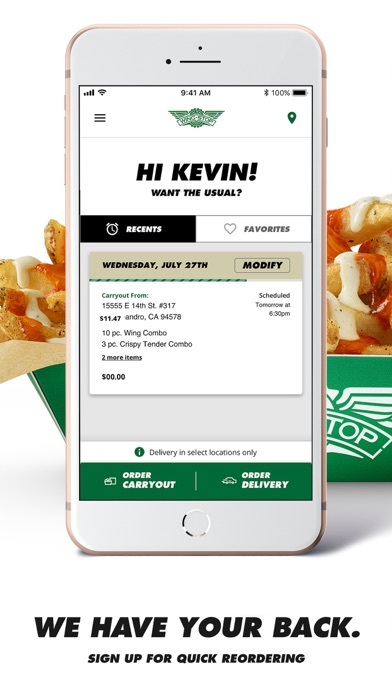 When I first heard that we can get wingstop delivered now I was happy cause I sometimes can’t drive or sometimes I don’t have a car to go pick up , I was making my order just to find out that you can only get it delivered if it’s over 15 dollars and my total was 17 dollars and some change and it didn’t wanna make the order.